Discover Nairobi then journey to the most impressive Kenyan National Parks. Amboseli is known for its large elephant herds and views of Mount Kilimanjaro. Superb viewing in Aberdares and the awe of the natural wonders of Lake Nakuru. The Maasai Mara surpasses all expectations as you go in search of the Big Five. Enjoy the landscapes and majestic wildlife on this unforgettable adventure. International flights U.S. - Nairobi - U.S.
7 breakfasts, 5 lunches and 5 dinners. Mineral water during game drive, 1 bottle per person per day. Important: We recommend that you check with your doctor which vaccines you need to travel to Kenya. Passengers should bring only soft side bags on safaris. Kenyan visa (check before traveling), vaccines, drinks, tips and any other services not mentioned in what's included. If you are traveling to Kenya with a U.S. passport, you will require a Kenyan visa. You can apply at http://evisa.go.ke/evisa.html. For other passport holders, we recommend that you check with the Kenyan Embassy for more details. Arrive at U.S. departure airport ready to check-in for a flight to Nairobi. Overnight flight. Arrival and transfer to your hotel in Nairobi. Nairobi is the capital city of Kenya also known as the "green city in the sun" for many reasons. Great places to dine in Nairobi range from fast food restaurants to restaurants where you can enjoy authentic Kenyan cuisine.Overnight stay. 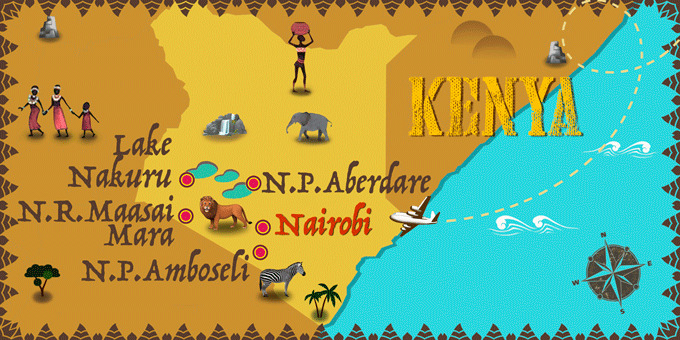 Depart from Nairobi to Amboseli National Park. Lunch at the Lodge. In the afternoon take a photo safari tour of the park. The park is known for its large elephant herds and views of immense Mount Kilimanjaro, across the border in Tanzania. Dinner and overnight at the lodge. Take a morning safari. Breakfast at the hotel. Enjoy a free day to discover vibrant Nairobi. Maybe take a look at The Nairobi National Museum which gives you a taste of Kenya’s heritage. Additionally, you will find wonderful dining facilities, a beautiful botanical garden, and eclectic shopping facilities. Breakfast at the hotel. Drive to Aberdares and enjoy lunch at Aberdare Country Club. The park contains a wide range of landscapes - from the mountain peaks that rise to 13,000 ft above sea level, to their deep, V-shaped valleys intersected by streams, rivers, and waterfalls. Moorland, bamboo forests and rainforests are found at lower altitudes. In the afternoon transfer to the lodge for a night of game viewing. Dinner and overnight in the hotel. Breakfast at the hotel. Return transfer to continue to Lake Nakuru National Park, with a visit to Thompson Falls in Nyahururu. Arrive at Sarova Lion Hill Lodge in time for lunch. Afternoon game drive at Lake Nakuru National Park. Dinner and overnight at the lodge. Breakfast at the lodge. Depart for the famous Maasai Mara National Reserve, arriving for lunch. The Maasai Mara is famed for its population of lions, cheetahs, and leopards and for its role as the migration destination for the annual Great Migration. Enjoy an afternoon game drive and discover the varied wildlife. Dinner and overnight stay. Today, enjoy either a full day on safari with a picnic lunch, or split your game drives into the morning and evening for a chance to see the immense size and diversity of this beautiful reserve and the changing landscapes as the sun rises and falls. All meals at the camp and overnight stay. Breakfast at the hotel. Return to Nairobi and arrive at Nairobi airport ready to check-in for your flight to the U.S. Arrival back in the U.S. End of your trip. Safaris will be in a 7 seater minibus.